Entries for 2015 are now closed. Be sure to Subscribe to our mailing list and Like us on Facebook to receive info on the 2016 event. 1. Purchase the Entry using the Pay Now button below. (You do not need to have a Paypal account to use this service.) Your purchase will be acknowledged by Paypal with a receipt. Watch for our confirmation that your entry was received in readable shape, and wait to hear the Good News from our judges! Pre-purchased entries accepted up to late deadline with $5 surcharge. This competition is open to any student through grade 12. Those under 18 must get signed permission to participate by a parent or legal guardian (see below). Entering the competition constitutes permission to use the submitters’ names and likenesses for publicity and promotions with no additional compensation. We reserve the right to publicize and promote any and all progress, development and success that the submitter has in the years to come. 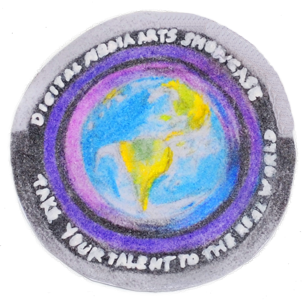 Additionally, entering the competition constitutes permission for Digital Media Arts Showcase (DiMA) to post all or a portion of your submission online exclusively in association with the competition. No other commercial use is agreed. Linear submissions (audio, video) may have a running time of as little as 15 seconds and as long as 120 minutes. Student artists under 18 must show permission is granted by a parent or legal guardian for minors (see Entry form). Multiple entries from the same student artist are accepted but each must have its own Entry Form and Fee. Completed project, or link thereto.